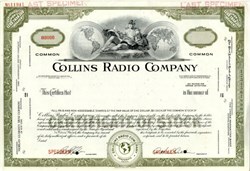 Beautifully engraved specimen certificate from the Collins Radio Company (Rare Specimen) - Early Ham Radio Manufacturer This historic document was printed by the American Banknote Company and has an ornate border around it with a vignette of an allegorical figure sitting between two globes. This item has the printed signatures of the Company's officers. The Collins Radio Company, as an organized business concern, began in the late summer of 1932. At that time, Arthur Collins and an associate - who later left the company - were the nucleus around which the firm was to develop. It was not until May of 1933 that they were financially able to hire a full-time employee. By Christmas of 1933, the total personnel amounted to 8, including Mr. Collins and a stenographer-secretary. Today most everyone is at least faintly familiar with the term "Ham Operator", and understand it designates one who has embraced radio as a hobby. There are literally hundreds of thousands of these hams scattered over the four corners of the earth, bonded together with a common love of electronics, and the self-satisfying desire to "build it yourself." Since the practical achievement of radio-wave transmission by Marconi, and the discovery of the vacuum tube by DeForest, these hams have been the greatest single factor in the contribution of knowledge to the practical aspects of the radio art. When World War II broke out, America was already well in the lead of the electronics field. These hams were already trained and thoroughly familiar with its requirements.